The StitchLiner Mark III features expanded booklet size and increased productivity up to 6,000 booklets per hour. The system can produce a wider range of applications, including landscape-size booklets, 12” by 12” calendars, and pocket booklets down to 4.5” by 3.5”. The StitchLiner Mark III offers fully automated setup, including stitching head settings, with no manual adjustments required for book thickness at the trimmer, delivering higher quality booklets with greater efficiency, even for variable stitch length and variable page count booklets. - In addition to booklet format and thickness, all necessary adjustments which includes length and balance are automated. - Professional quality production is achieved with newly designed systems for sheet transport and jogging, scoring and folding, stitch and fold monitoring, and positive jog register at the trimmer. - True end to end automation for variable thickness production. Variable stitch length and balance adjustment combined with variable thickness transport adjustment through the trimmer. - Expanded format size to meet A4 landscape large format calendar production. 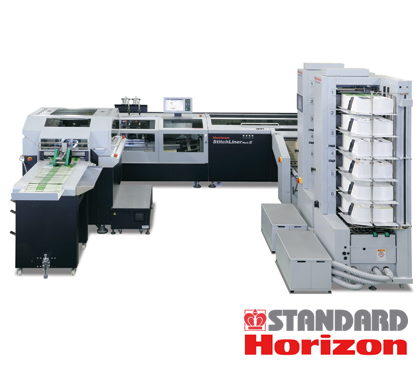 Higher productivity is achieved on a wider range of formats, including A4 landscape at over 5,000 per hour. - The StitchLiner MarkIII can be integrated with the VAC series collator* and HOF-400 High-speed sheet feeder. *System does not have compatibility with VAC-100a and VAC-60Ha towers. Has to be VAC-1000a or VAC-600H. Middle tower and rear tower can be VAC-100m/c and VAC-60Hm/c. Due to the variety of configurations available, click on the brochure link near the top of this page.